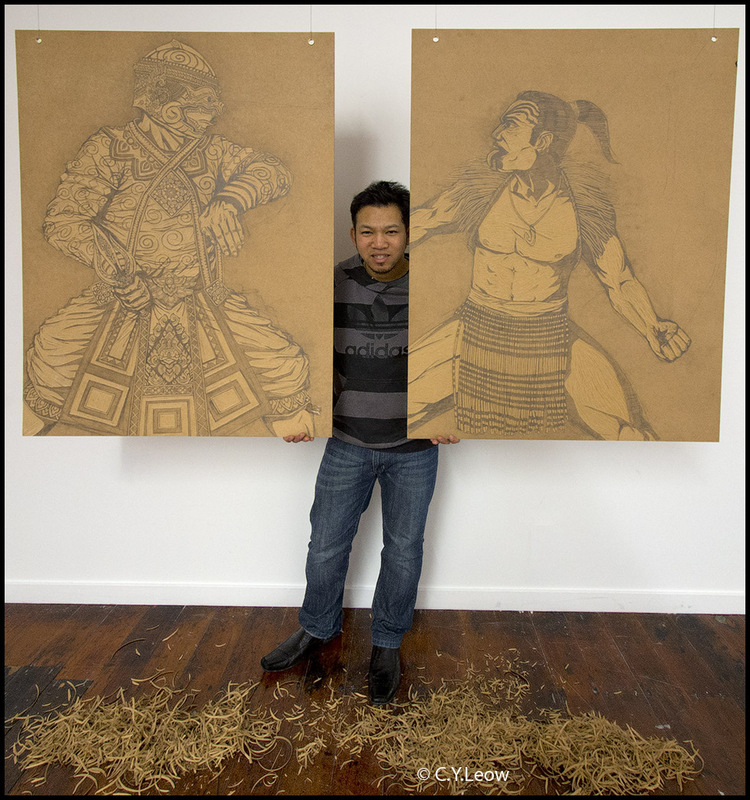 "My art work is about how I have tried to understand where my Thai identity fit within a strange new world (New Zealand). For example, when I was a child; I remember talking to my Mum after school asking if we could start speaking in English instead of Thai to each others, it would be easier for me. I found it challenging to switch between the two, English at school and Thai at home. Then one day everything clicked! I became familiar with my own identity. I became comfortable with merging my Thai identity, with the Kiwi culture, it was my art that was the catalyst for this." At 10 years old, being the only Thai lotus in a strange new forest. "I have always enjoy art, I find it peaceful; a way of reflecting on myself. I find different patterns correspond to my energy. Conceptual work is what I also enjoy... figures, people, sometimes comical, but abstract conceptual is my trend. My line work is powerful and is a signature of my creativity. This exhibition reflects natural colours: golden ochre for Thai and Buddhism, red; white and black for Maori designs. To me, these colours reflect blood, earth and identity. I use contemporary current ideals but use traditional patterns and colours. 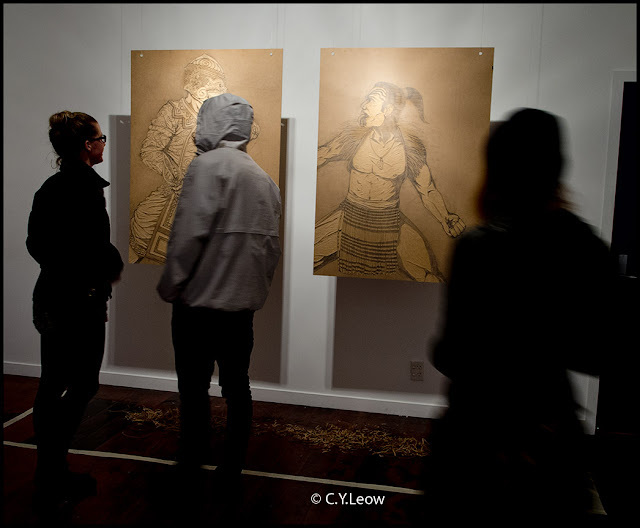 My work in this exhibition bridges the gap between two cultures; Thai and Kiwi." Nine years old and elated. 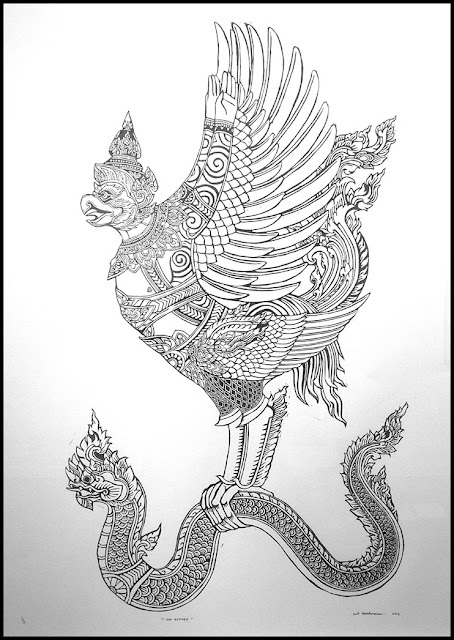 My mother (Naka) returned to Thailand and my life calmed by a Garuda (Thai mystical bird). "To be Kiwi means to me: lifestyle, culture of the people; people are proud of their heritage, especially Maori. Thai culture doesn't really come through to the younger generation. With Maori, the younger generation knows their identity, their iwi, hapu. Thai youths have become more Westernized; they move away and don't look back, they don't understand where they came from. My art work is more respectful of my Thai culture. This work is important to me, to know where I came from in order for me to move forward. 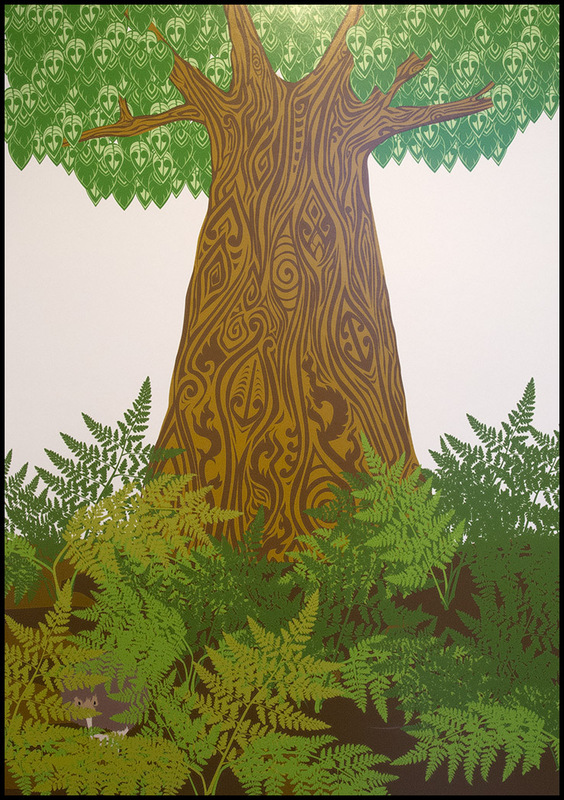 I use Maori artwork to reflect my Kiwi identity because Maori culture is part of 'kiwi' culture to me. I know that to be kiwi for many, is to acknowledge Maori as tangata whenua, New Zealand's own identity. Imagery used in the Maori designs are similar to Thai designs; fluidity and patterns used as symbols and metaphors. I find it easy to relate to Maori and Polynesian cultures, most of my friends at school were Polynesian. I have accepted this part of myself. 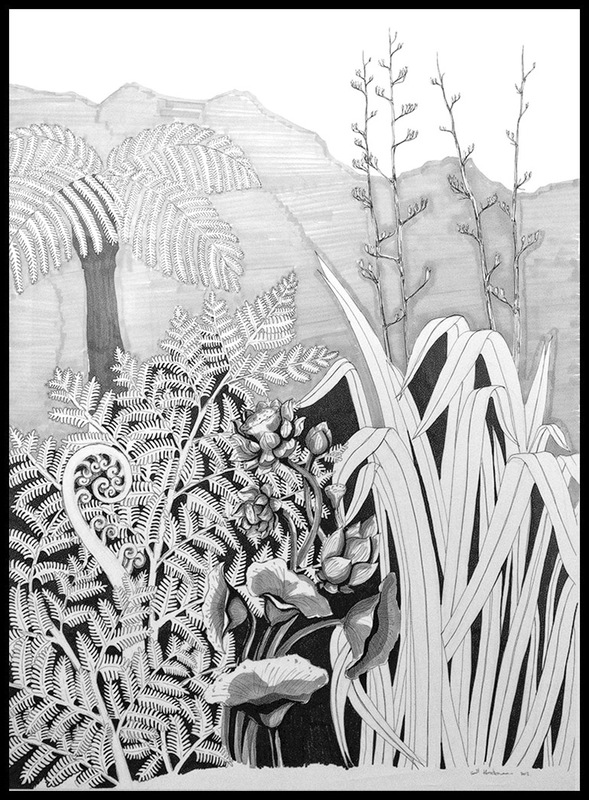 It is this part that is reflected in my artwork; my identity sitting with the design and structure of Maori arts and patterns." Bamboo - a material to build the houses and build your life. "My work is very personal and is about strength, culture and identity. It's about being true to who I am – my Thai roots, while also acknowledging the Kiwi part of me now. When I was younger, I tried to hide the Thai part of me, I tried to fit in more, be more like my friends. But as I saw how people in New Zealand were comfortable with their identity, I was able to explore my own creativity in using his 'blood', this “bond”; I was forging with my new home and explore it in my own work. 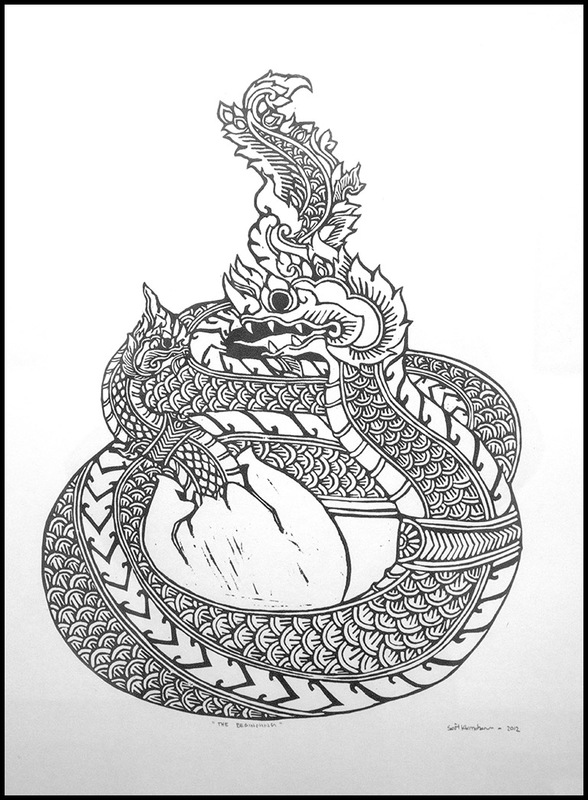 In my third year of my bachelor of fine arts, I depicted myself as a Thai snake (Naga), wearing a tiki mask. This show how I was trying to hide my Thai side, trying to be Kiwi. The Rose petal motif is symbolic of love in Thai culture. "I understand now how my children will not be of just one culture and that by supporting and incorporating all different cultures one can still be in harmony with themselves and others without compromising another cultural aspect of one’s identity. Seeking knowledge and supporting the tribe. Yellow, black and white are also the colours of Wellington College, where I began my life-long love of woodcut printing - thanks Mr Costello! "I call myself a "Kiwi-Thai" - I act like a Kiwi but know and respect where I come from. People know Thai dancing, Thai boxing and Thai food. But I do not believe that most know what Thai art is. The only place people would see Thai artwork is in Thai restaurants ." A Thai snake (Naka) entering the world, representing birth in Thailand. "I have not seen many Thai exhibitions so I am very proud to be raising the profile and education of Thai culture through this exhibition. The final piece in the exhibition will look to the future. It synergies all cultures into one taking the form of a tree; the symbol of growth, strength and knowledge, and something that can span across all cultures!" Discovering peace with the embrace of two cultures. The exhibition is open from 10.00 am to 6.00 pm until Saturday 4th August 2012. Admission is free. “Kiwi-Thai” at Thistle Hall, 293 Cuba St, Te Aro, Wellington. Sanit's web site and contact can be found HERE. We wish him all the best!! Sanit, interesting read about your heritage. Knowing your cultural roots is about loving who you are, understanding where you've come from, and preparing for your future. Wow! Amazing creativity! I really like the pencil sketch on cartridge paper and the tree.he has incorporated and blended the cultures in art so well.